There have been a handful of paperbacks sold of each of these books, and there have been a few giveaways of other books, but that is pretty much it. Sometimes I really wish I had 30 cents for each copy of His Robot Girlfriend, but I know it wouldn’t have been downloaded so many times if I charged for it, and it has done its job of bringing me new readers. I have plans for a couple of other free books, one of which should be available this year. 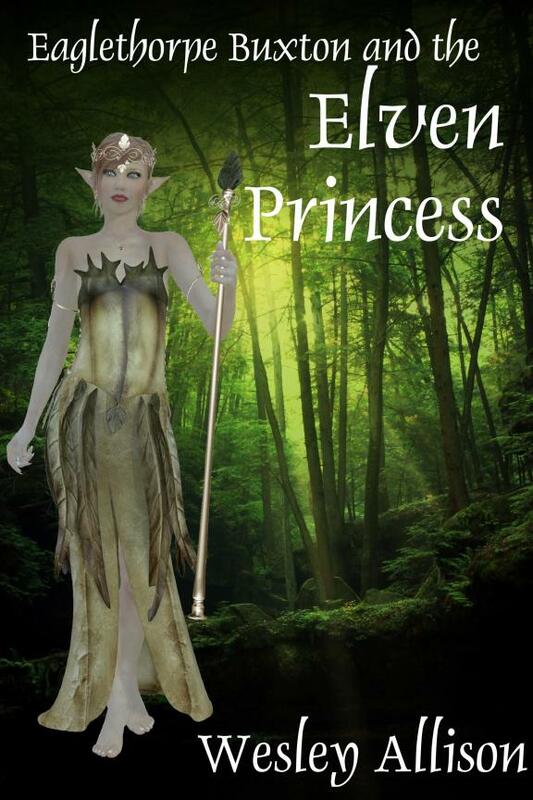 The elven princess in Eaglethorpe Buxton and the Elven Princess is not a particularly inspired character. She’s a stock elf and a stock princess, though I flatter myself that I gave her a bit of personality. She has to have some to deal with Eaglethorpe in their day to day dealings. She’s his foil, his sounding-board, and at one point (SPOILER) his foe. I tried to weave a little Shakespeare into the tale (something I did much more blatantly in the second EB story) by making her take up the disguise of a boy. One thing that I notice of course, is that people either hate or love Eaglethorpe Buxton, but it’s usually him and not his world or the other characters that brings out this diverse reaction. I would love for someone to write me and tell me what they think of Jholiera. Incidently I just randomly threw together some sounds to make an elven name. These two reviews were recently posted at Smashwords. What a delightful tale! Wesley Allison, author of “His Robot Girlfriend” and the sequel, “His Robot Wife,” has done it again. His characters and style of writing about them in this story reminds me a bit of Mark Twain. He caught and kept my attention from beginning to end and had me chuckling constantly. Thanks to both of you gentlemen for your kind words. For those interested, I do have big plans in the works for Eaglethorpe. There will be a new tale by the great storyteller (liar) or THREE coming soon– hopefully this summer. Eaglethorpe Buxton and the Elven Princess has surpassed 50,000 downloads. It’s available wherever fine ebooks are found and it’s absolutely free. Eaglethorpe Buxton and the Elven Princess – 10,000 Downloads! Eaglethorpe Buxton and the Elven Princess has topped 10,000 downloads! Actually, it’s already topped 11,000 but we’ll just celebrate the big round numbers. It is available wherever fine ebooks are found, and it is free. A brief tale of low magic and high skulduggery, set square in the world of pointy-eared elves and short-arsed goblins. Our self aggrandising hero has a genuine way with words and if you like the genre to be touched with humour this for you. His Robot Girlfriend has dropped down below 50 on the free ebooks chart at iBooks, but it is still number 2 in the Free Science Fiction and Fantasy category. What’s more, Eaglethorpe Buxton and the Elven Princess is number 15 on that chart, Eaglethorpe Buxton and the Sorceress is number 18, and Senta and the Steel Dragon Book 0: Brechalon is number 27.